Many a times the network of buyers, sellers, and other actors that come together to trade in a given product or service may not be able to allocate resources efficiently. This market failure forces a government intervention into the economic system ( thus strengthening the Keynesian school of thought that government role is inevitable in the economy) to correct market failure. Price controls by government authorities which is one such intervention, affects market outcomes. 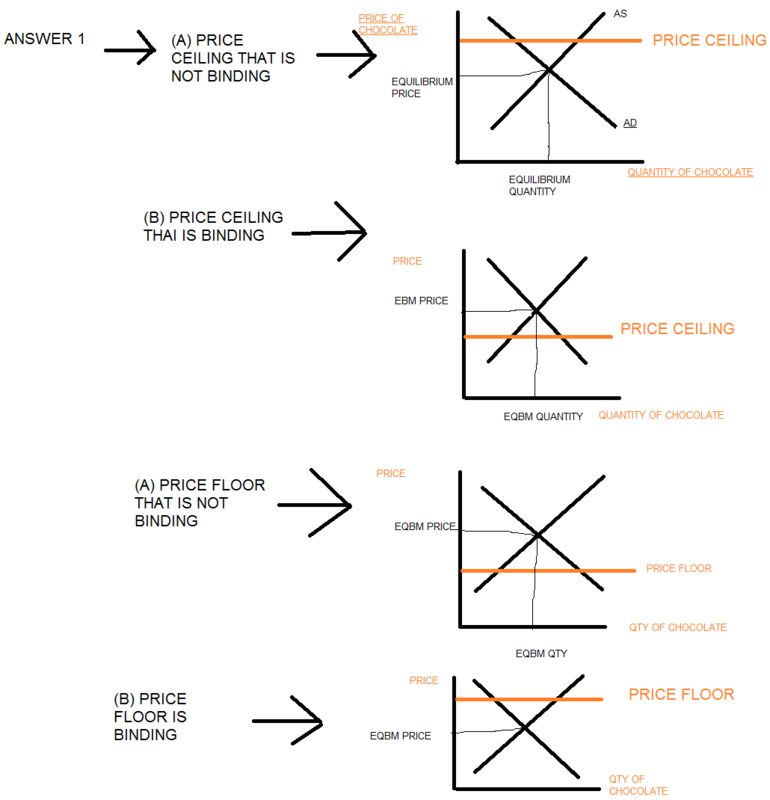 Price ceiling and price floor are two types of price controls imposed by govt. Government imposes a legal maximum price of a commodity at a level lower than the equilibrium price. Because the price is not allowed to rise above this level, this maximum price is called a price ceiling. This is beneficial to the consumer of that commodity. Here government imposes a ceiling of a price greater than the equilibrium price and thus has no effect as the arket can reach the equilibrium supply and demand. When the price ceiling is binding then quantity supplied and quantity demanded are unequal. Demand is more than the supply . When government imposes a binding price ceiling on a competitive market, a shortage of commodity arises and sellers must ration scarce goods among the large no of perspective buyers. Thus we can say that competitive markets are fully efficient. Price ceiling leads to the formation of black markets. Black market is any market where commodity with price ceiling is sold at a price higher than the maximum price fixed by government. Black markets exist because consumers are ready to pay a price more than the price fixed by the government to get more of the limited amount of commodity available. The rationing mechanisms are rarely desirable. Long lines to buy goods at ration shops waste a lot of time of the buyers. Sellers may be biased towards some buyers and this may cause inefficiency as goods do not reach the buyer who values it the most. Sometimes goods may not be available in the ration shops or may be the good is substandard. Price floor is the minimum price that is above equilibrium price fixed by govt which producers must be paid for their produce. This is imposed by the govt when it is convinced that the price fixed by demand and supply is not remunerative enough from producer’s point of view. Some of the well known examples of importance of price floor are agriculture price support system and, minimum wage legislation. Here price floor has no effect as equilibrium prices are already higher than the price sanction imposed. In this case, government imposes price floor which is above equilibrium price. When price floor is a binding constraint on the market then price cannot fall below the price set by government and thus quantity supplied is greater than the quantity demanded and equilibrium is not reached. Thus a binding price floor causes a surplus =. Like price ceiling which causes shortages and leads to undesirable rationing mechanism, so can surplus resulting from price floors. Sellers are not able to sell all they want at the market price. The sellers who appeal to the personal bias of the buyers due to racial or familial ties are able to sell higher than those who do not. Three small economies, Noil, Regit and Aneyh, asked you to be their economic consultant. Noil is an orthodox Keynesian economy, Regit is a monetarist economy, and Aneyh is a supply-side economy. Some higher-than-normal unemployment currently exists in each of these economies and you know that it has been caused by a supply shock. (Keynesian) being a Keynesian economist i would consider demand as the sole driving force in the economy. Keynesian remedy to remove unemployment in an underdeveloped economy ( noilian which is a small economy) may actually plunge the conomy into an inflationary spiral. But being its finance minister i would recommend increasing the aggregate demand by way of increased government spending by increasing incomes of people. in small economies increased income increases consumption more as compared to savings as marginal propensity to consume is almost 1. (Monetarist) being a monetarist, i would want the government to increase the amount of money in circulation i.e increase money supply which leads to increase inaggregate demand as people have more money which they may use to buy more goods and services. This increase in aggregate demand may in turn lead to an increase in employment. However this may lead to inflation and wipe out short term gains. As a supply side economist i would focus on increased production that will drive economy on growth path. My focus will be on businesses and in order to increase growth and reduce unemployment i will aim at increasing economic activity in the economy. I will recommend the government to use tools such as corporate tax cuts, deregulations on businesses and any other tool which incentivizes businesses to epand its operations. Expansion will result in firms and businesses hiring more workers and thus resulting n job growth and boosting overall economic growth. As an adviser to a new finance minister of a developing country, you have been tasked to produce a policy brief on how to stimulate the growth of the economy. Using the AD-AS (aggregate demand and aggregate supply) model, discuss using the relevant diagrams and at least two examples of supply-side measures and two demand-side measures, how the government can expand the economy. 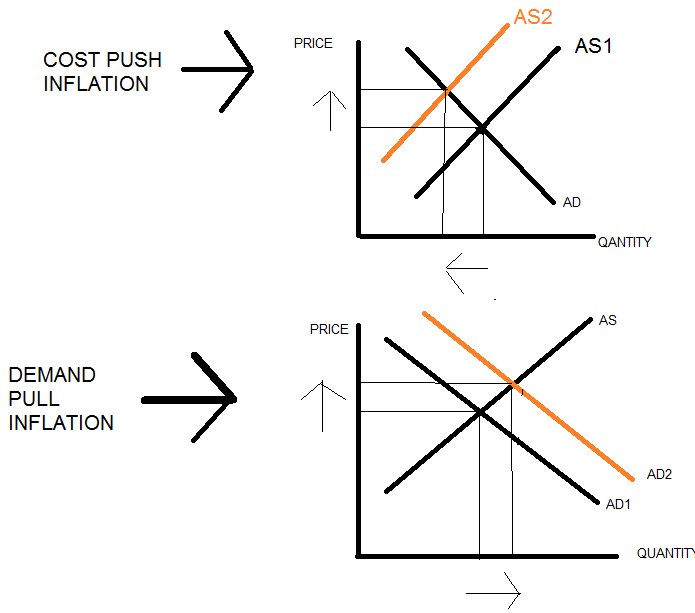 Using the aggregate demand and supply analysis, explain with the aid of diagrams the concept of (i) cost-push inflation and (ii) demand push inflation by assessing how the two impact on the price level, real GDP and employment. Cost push inflation occurs because of a decrease in aggregate supply of goods and services due to high production cost. The prices of goods and services are pushed up by increases in costs of factors of production – land, labor, entrepreneur, capital. When fluctuations in general prices in the economy occurs because of fluctuations in production costs then it is cost push inflation. If cost of labor increases then the company has to allocate more resources to produce same amount of goods. 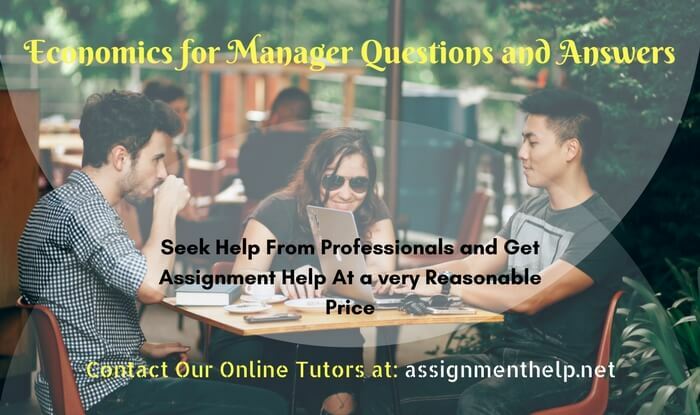 To maintain the level of profit margin, company passes on the cost to consumers and thus increases overall general price level in the economy. Prices of raw materials also affect general price inflation. In case of scarcity of raw material, or high cost of transport of raw materials to factory places leads to high production cost. This cost has to be passed on to the consumers to maintain profit margin. Thus there is inflation pushed by increased cost of factors of production. High production cost decreases aggregate supply as same level of output can only be achieved at higher price level. Thus as aggregate supply decreases, general price level increases ( assuming aggregate demand is unchanged) and real GDP reduces. As production cost increases, firms may cut on labor leading to higher unemployment. This cost push inflation causes high general price level, low real GDP, high unemployment rate in the economy. This type of inflation occurs when there is increase in aggregate demand. When people wish to buy more than what the economy can offer, the result is increase in prices as people compete with each other to purchase scarce goods. This usually occurs when economy is on a growth path. One of the factors pulling up inflation may be an increase in government purchases. When government expenditure increases, suppose in infrastructure, aggregate demand increases as a result of income generation. When aggregate demand increases without any increase in aggregate supply the price level increases. This is because to meet rising demand firms have to produce more which increases cost of production. Production cost increases because firm has to employ more additional labor to produce more. The firm passes this increase in production cost to consumers in order to maintain profit margin. Thus in demand pull inflation prices rise, real GDP rises as aggregate demand increases the economic activity and employment rises as firm employ more labor to produce more goods.